The uranium miner and nuclear fuel fabricator continues to be hindered by sour market conditions. Should investors expect a break anytime soon? The global uranium industry has seen better days. That's putting it mildly, actually. Selling prices for long-term supply contracts have dipped 42% since August 2013 -- and that includes a 9% surge in the last two months. Therefore, it's not too surprising that shares of leading uranium miner and nuclear fuels fabricator Cameco Corp (NYSE:CCJ) have dropped 41% with dividends included in that span. Despite the five-year slide, the well-managed business has persevered. Difficult decisions to shutter two critical uranium mines will preserve the balance sheet and actually provide a 20% to 30% boost to operating cash flow in 2018 compared with last year. The uranium markets also seemed to approve of keeping production offline, as the announcement was the catalyst for the 9% surge in global uranium prices at the end of July. Are things finally heading in the right direction? Does this make Cameco stock a buy? The roughly $4.2 billion uranium miner has done its best to mitigate market weakness that has lingered since the Fukushima incident in March 2011. That has been made possible by long-term supply contracts signed years ago, which provide a relatively predictable foundation from which to work when planning business decisions. However, the company is racing the clock, as the bulk of its long-term contracts begin to expire after 2020. And even current contracts are influenced by current market prices, which resulted in falling revenue and income in the first six months of this year compared with 2017. NOTE: All dollar amounts are reported in Canadian dollars. Data Source: Press release. That said, the most important takeaway from the table above is the gap between production and sales volumes. After resisting for years, Cameco has finally decided to take the lead on global production reduction in an effort to rebalance the uranium market. Investors now know the strategy will remain in place through at least 2019. Cameco made the decision to keep its McArthur River and Key Lake mines offline indefinitely, which extended a suspension that was originally only expected to last 10 months. The business will incur about CA$42.5 million in severance costs in the third quarter as a result. Upfront costs aside, the important thing is that Cameco expects to produce only 9 million pounds of uranium in all of 2019, compared with 23.8 million pounds produced in 2017. It will fulfill the bulk of delivery commitments with inventory and market purchases, which should help to rebalance markets. Will it be enough? CCJ Total Return Price data by YCharts. Well, the market responded quickly to the announcement that McArthur River and Key Lake would remain offline for the foreseeable future. The news sent uranium spot prices to their highest level since June 2016. But it's still too early to know for sure if the company is driving sustainable changes to the market or if other global players will take advantage of the temporary void. It's also important to consider the long-term prospects for uranium -- and they don't seem great. While investors often point to expected growth in nuclear power in China, the country sources its uranium from the world's leading producer, Kazakhstan. That hasn't translated into a rising tide for global producers: China has nearly tripled the amount of electricity generated from nuclear power since 2011, but uranium prices have continued to slide nonetheless. Combine that with the fact that nuclear-heavy Western countries such as the United States and Germany are closing nuclear power plants -- with no plans to build new ones -- and the outlook for uranium isn't very strong. It's possible Cameco can use its relatively massive size to build a valuable niche in whatever remains of the uranium market in the coming decades, but it's still too early to know for sure. I think the decision to purchase this stock may be a lot simpler than many analysts make it out to be. Consider that the Fukushima nuclear disaster happened over seven years ago now, but the global uranium industry has still not found its footing, nor do any major catalysts appear to be on the horizon. Many established nations are moving to take nuclear power plants offline in the coming decade, while building new facilities is becoming prohibitively expensive. The closures will nearly offset any gains from new construction in China, which so far hasn't exactly delivered on the hype. Similarly, growing sanctions on Russia -- a crucial exporter of nuclear technology -- could further stunt the global industry. Or at least the parts accessible to Cameco. 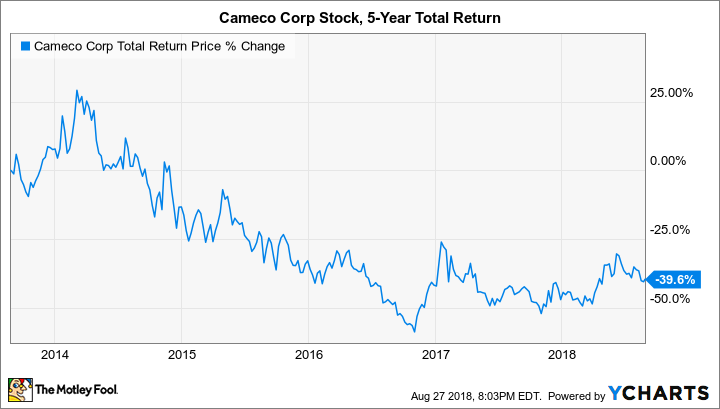 In other words, the uncertainty and complexity of the situation is a pretty clear signal that individual investors will likely be better off making Cameco stock one to avoid.